Germany v Spain saw two teams with very similar tactical nuances pitted against one another. Both sides like to press high and pass the ball out of the back when possible. Several times both Germany and Spain found themselves cornered in their half trying to escape by playing short passes to each other. Both teams also struggled at times to get out of their defensive corners, which made it look like that both die Mannschaft and the Seleccion had defensive short-comings. At the same time, however, the reality is that both teams like to press high, which would make it difficult for any side to break free. In the second half, some of the smaller differences between the two teams were more apparent. 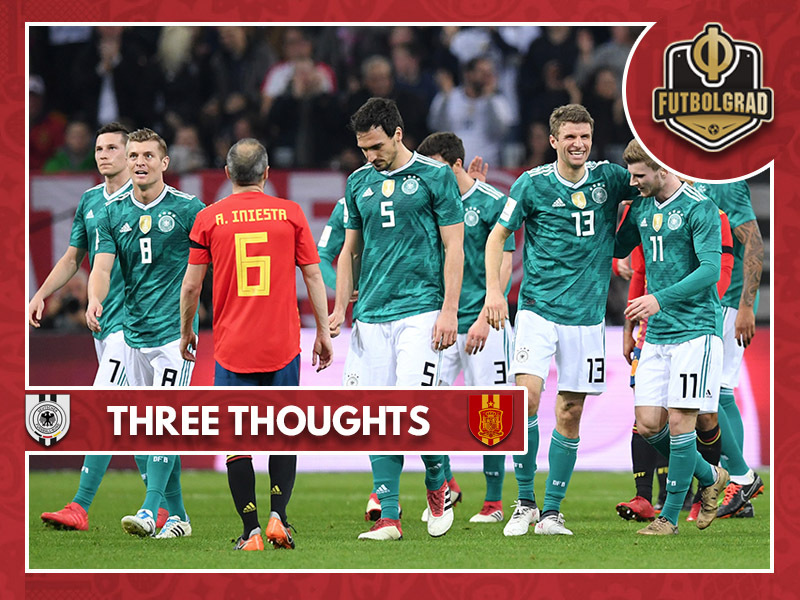 While Spain’s backline continued to play out of the back with short passes Germany’s defenders Mats Hummels, and Jérôme Boateng looked to play a long ball on Germany’s quick attacking quartet. 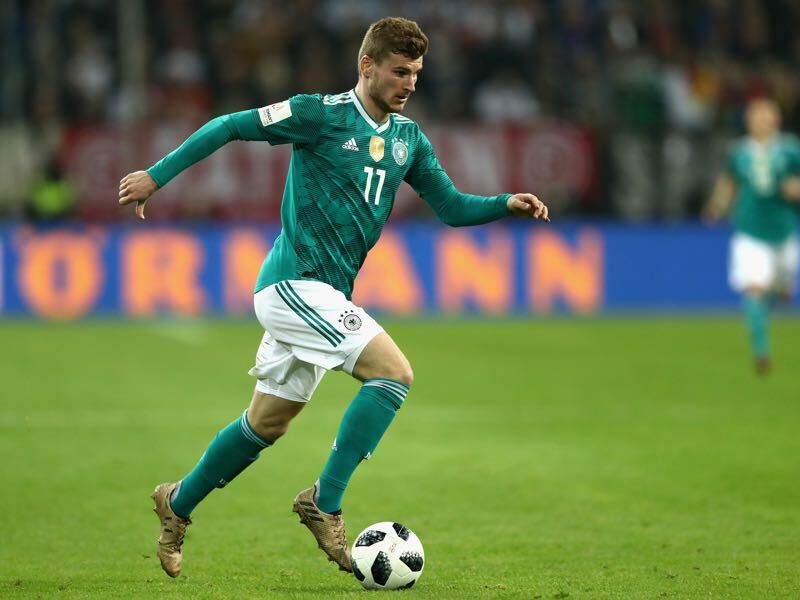 The speedy Timo Werner, in particular, looked dangerous for Germany when picked out with a long-ball. Germany also seemed better at switching sides opening up the play when breaking forward more efficiently. Spain in the meantime had the edge when it came to keeping Germany pressed into their half. Overall, we got to see a tactical masterclass by perhaps the two best national teams on the planet at the moment. Timo Werner started for Germany, and although he was kept off the scoresheet, he was among Germany’s best players in Düsseldorf. His ability to quickly break forward but also be a part of Germany’s combination play makes him the ideal candidate to start in what will likely be a 4-2-3-1 formation in most games for Germany in Russia. The race for the backup position in the meantime remains wide open. Both Mario Gomez and Sandro Wagner represent the type of forward Germany will need should die Mannschaft find itself in need of a breaker. Both strikers are better suited when Germany have to operate against deep-lying defensive formations. Germany v Spain was all about the quick transition game, and with his speed, Werner not only creates chances for himself but also for the attacking three situated right behind him on the pitch. The good news ahead of the Germany v Spain match was that Manuel Neuer has begun with running practice. At the same time, Neuer will need to return to the field as soon as possible to regain the match fitness before the tournament kicks off in Moscow on June 14th. But even in the worst case that Manuel Neuer will not be ready by this summer, or sustain a further setback, which is always possible with a broken metatarsal, Germany know that they have a reliable backup in the form of Marc-André ter Stegen. The Barcelona keeper was without a chance when Rodrigo Moreno escaped Germany’s defence to make it 1-0 for Spain. He then, however, kept his side in the match and was there when needed even after Germany equalised. Furthermore, his passing and positional play is perhaps second only to Manuel Neuer, if not on par already.